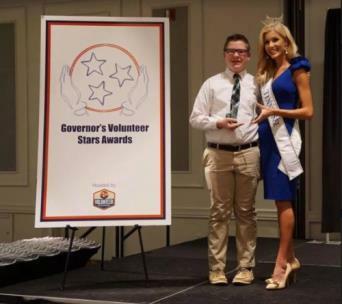 Amy Jo Osborn and Jackson Love were named Hamilton County’s winners of the 2018 Governor’s Volunteer Stars Awards. 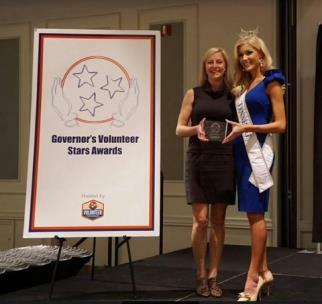 They were honored yesterday along with winners from other Tennessee counties at the Annual Governor’s Volunteer Stars Awards Program in Franklin. According to state generated statistics, 1.6 million Tennessee volunteers give more than 137 million hours of service, contributing the equivalent of $3.3 billion to Tennessee’s economy. "They are the backbone of our great state giving their time and talents to fulfill needs; they truly embody the spirit of giving. We were honored to have both of these outstanding volunteers represent Hamilton County," officials said. "Hamilton County’s Austin Hatcher Foundation Co-Founder and President Amy Jo Osborn is the adult winner for the Governor’s Volunteer Stars Awards," officials said. "Amy Jo serves the foundation with a minimum of 40 volunteer hours per week. Under her leadership, the Foundation improves the quality of life for younger cancer patients and their families through a variety of innovative programs and services, provided at no cost. "Since the Foundation’s inception in 2006, it has assisted approximately 72,000 children and family members in 28 states. She has built numerous relationships with local businesses that have resulted in unique fundraising initiatives that have benefited both the businesses and the Foundation, making her a vibrant contributor to Hamilton County." "Jackson Love with the Humane Educational Society is Hamilton County’s Youth Honoree," officials said. "While volunteering at the shelter, he can be found walking dogs or working with them in the play yards, which is extremely important in enriching their lives, both physically and mentally. He has volunteered at numerous adoption events and worked at their monthly vaccine clinic. "Jackson is an impressive young man that shows great compassion and love for the animals in need throughout our community. What a great example he has set for our youth in Hamilton County."